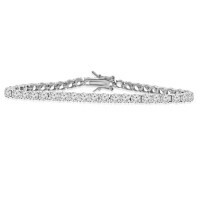 If you're looking for the classic tennis bracelet, or a lovely diamond timeless treasure, our "Classic Diamond Bracelet" collection is THE place to find it! 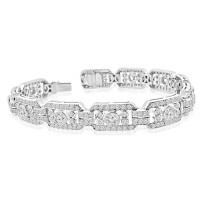 This collection of exquisite diamond bracelets and splendid tennis bracelets feature an amazing group of elegant, classic, and very hard-working designs. You will find the kind of pieces every woman needs to own in order to make sure her jewelry wardrobe is complete! These are the pieces that will be chosen over and over, whether for the boardroom or the ballroom. 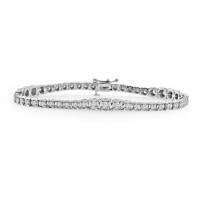 You absolutely can't go wrong with one of these incredible tennis bracelets! 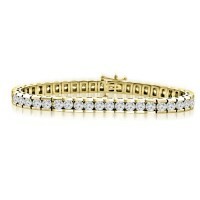 Delightfully dazzling, this tennis bracelet is a winner all around. 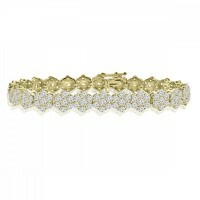 Beautifully crafted in 14K yello..
Delightfully dazzling, this tennis bracelet is a winner all around. Beautifully crafted in 14 kt yel..
Handcrafted in-house at Madina Jewelry, the alluring solid 14K white gold 5.40 millimeter tennis bra..
Handcrafted in-house at Madina Jewelry, the alluring solid 14K yellow gold 5.40 millimeter tennis br..
Delightfully dazzling, this tennis bracelet is a winner all around. Beautifully crafted in 925 kt si..